Any .csv, .txt, or .xml file must not exceed the limit of 8 MB. Any individual file in the .zip file, including files in attachment folder, must not exceed the limit of 8 MB. If you have a source data file that is over 8 MB, split the data into several files (making sure to include the header row in each file) and import them separately. Because multiple users in an organizations can submit import jobs at a single point, if two or more imports are happening simultaneously, the .zip files containing files with file size smaller than 1 Megabytes (MB) are imported immediately and the .zip files that contain files with file size larger than 1MB are queued and imported after the smaller .zip files are imported. For example, two .zip files, A.zip and B.zip, are being imported simultaneously. If A.zip contains files larger than 1 MB and B.zip contains smaller files, then B.zip will imported immediately but A.zip will be queued and imported after B.zip is imported. No column in your source file must be mapped to the file Name field of the Note record type in MSCRM when notes are being imported. Doing so can cause the import to fail. If any column of the source file is mapped to the Document Body field of the Note record type, then the source file is considered to include information about Attachments. The value in source column that is mapped to the Document Body is the file name that is used to search a file in the Attachments folder in the .zip file. Note: We recommend a Test run with lesser number of records before proceeding for actual data import, so that you can check if there is any issue with the map or data or environment. If the record types being imported have cyclical dependencies and the lookup fields for these record types are not valid for update, the import may fail. However, if any of these record types have lookup fields that are not valid for update, that is, the values for these fields must be provided during record creation and it cannot be updated later, then the import of such records may fail. If the date/time format of your source data differs from the one set by you in CRM settings, then consider changing the CRM format settings accordingly before starting Import. It is advisable to take a small number of test records and verify your expectations before starting import. Microsoft Dynamics CRM 4.0 Data Import Manager validates the date data in your source data during import. In cases where the date data is not in the format specified by your date format setting, DMM displays an error. The new Import data Wizard understands the date time settings of the user in whose context it is running. To change the user timezone in CRM go to Tools à Options and change your time zone. To change the date format settings go to Tools à Options à Format àCustomize à Date, change and save the settings. These settings will be used by Import Wizard to import the dates and times. If you share or assign a single import file, all files imported in the same import session will also be shared/assigned to the selected user or team. Users created during the import will be assigned a salesperson role and these users may not have the privileges on custom entities which may result in records of these custom entities to be owned by the user selected in the Select Owner for the Imported Records. A Read privilege for the record type to be displayed in the record type drop down. A Create privilege for creating users. These privileges are required to finally publish the customizations. The same privileges are checked if you try to add fields through System Customization flow. The ownership is resolved based on the metadata information specified in the data map. If the required information for a user is present in the source file containing the user data, but the owner cannot be resolved, then the user is created in deactivated state and is used to resolve owners. For the records whose ownership could not be resolved using Steps 1 and 2, the user selected in the wizard becomes the owner for the imported records. The newly created users are imported with data in only these fields. 2. If the required information for a user is present in the source file containing the user data but the owner cannot be resolved using step 1, then the user is created in deactivated state and is used to resolve owners. 3. For the records whose ownership could not be resolved, the user selected in the Import Data wizard becomes the owner for the imported records. CRM tries to resolve records with the existing CRM users, using lookup transformation for the primary field (Full Name) of the user record type. For the records whose ownership could not be resolved, the user selected in the wizard becomes the owner for the imported records. Note: Whenever duplicate CRM user found on owner resolution, set ownership (ownership is set) to the CRM user selected in the wizard. Users created during the import will be assigned a salesperson role and these users may not have the privileges on custom entities which may result in records of these custom record types to be owned by the user selected in the Select Owner for the Imported Records. Stand-alone import of user data is not supported. User data is necessary to determine ownership of the records that you are importing. Therefore, importing only user data without importing associated records, is not supported. Always import user data with the other record types that the users own. CRM always displays the success and error counts for the import file associated with user records as "0" in the Imports grid. To make a user an owner of the imported records, you must have a privilege to create records on behalf of that user. If you do not have the sufficient privileges, regardless of whether you specify a user in Select Owner for the Imported Records, the imported records for which you do not have privileges, will be owned by you. • Custom record type created during import is always user-owned. These fields cannot be changed once you create a custom record type. So, if you need certain record types to be created with properties different than this, we suggest that you create the record type manually in CRM. If a field used in a data map for mapping data is no longer available in CRM, an error is displayed. You will not be allowed to continue until you either map the source column to a different field or ignore the column. For some record types, the mandatory fields are different for different types of record types. If you fail to provide the information for all the mandatory fields, the records may not import. In the data import template for the Quote Product record type, only Quote and Quantity columns are marked as mandatory. However, due to some business logic, based on what you select in the Select Product column, the mandatory fields change for the Quote Product record type. For example, if you select Existing in the Select Product column, the Product and Unit columns become mandatory. This may be true in case of other record type also. If you do not provide the mandatory information in the source files, the records will not be imported. However, in such cases, you may not get a specific error. Thus, to understand the exact error try creating similar records through Microsoft Dynamics CRM Online and identify the mandatory fields for that record type that you need to fill in the CSV file for importing records successfully in Microsoft Dynamics CRM. 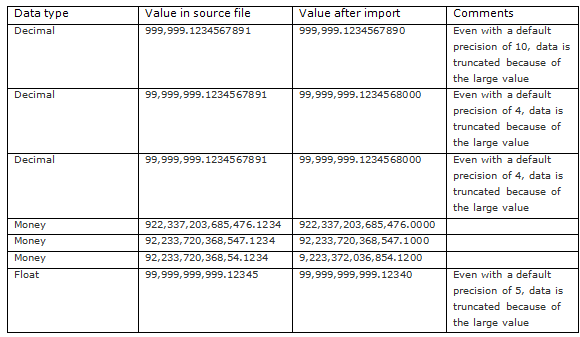 Numeric data with very large values, or many digits after the decimal point, may be partially truncated during import. Microsoft Dynamics CRM 4.0 includes default limitations on the precision of very large numbers, and numbers with many digits after the decimal point. Although these limitations can be modified through customization in the Web application, importing data by using Import Data wizard with default precision settings in the Web application can sometimes result in truncation of numeric data that falls outside the range of these settings. Even if truncation occurs, the Import Data wizard will not display an error message and will import the data. If you are importing numeric data to Decimal, Float, or Money fields, used by entities in Microsoft Dynamics CRM 4.0, verify that your source data does not contain data that falls outside of the expected range. If your source data contains very large numeric values, or values with many decimal places, and truncation is not acceptable during import, you can customize the target fields through the Settings area of the Web application before starting the import. Similarly, if you choose to create custom fields during the import process, there are limitations on the precision supported by Import Data wizard, as shown in the following table. Any data that exceeds these precision values will be truncated during import, and the Import Data wizard will not display an error message. I hope this will be very helpful when you use New Import Data Wizard for importing records into the Microsoft Dynamics CRM platform.